Oh hello friends! Today’s post is extra special, as I spent a Saturday baking up a storm with Kristie from The Sweet and Simple kitchen! She reached out to me on instagram a couple months ago…and I love that we’ve become fast friends! You might remember our peach blackberry pie adventure here, and you can read more about our first meeting there too. 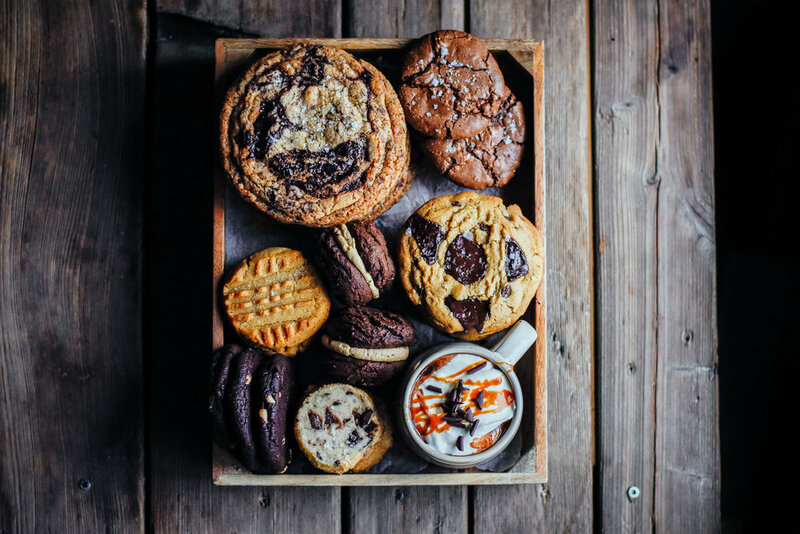 So, for this collab, we decided to bake a few internet famous cookies…as well as a few of our favourite classics, and make an epic cookie box. They’re all linked at the end! 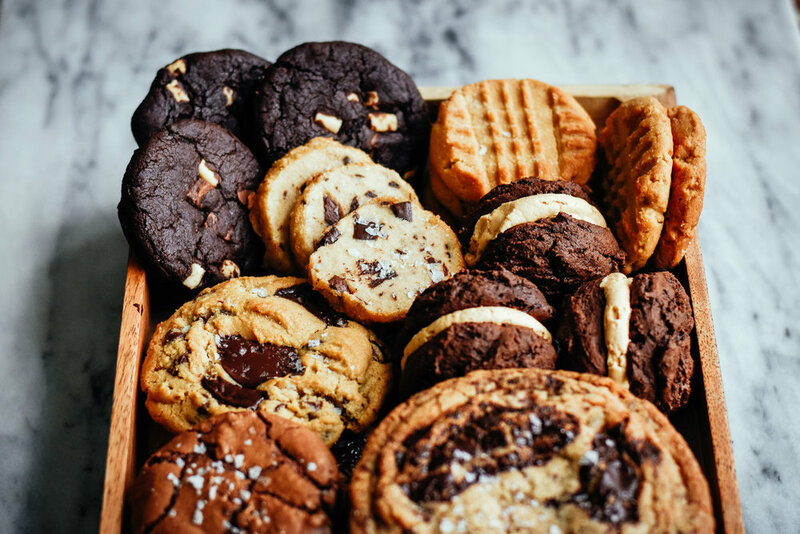 We chose a few different sizes, textures, types, and colours of cookies. Classic chocolate chip (in a couple sizes! ), shortbread, chocolate, sandwich, and a peanut butter cookie….we love how each one brought something different to the box. Assembling the cookie box was so much fun, as we tried our best to fit each cookie in and have it look amazing too. Testing each one was fun too. Ha! We made a salted hot chocolate to go with our cookies, and I’ll be sharing the recipe on the blog in a couple days! I also thought that I’d include a few of my top cookie tips, since a lot of questions we got concerning cookies were pretty similar! Why do my cookies spread so much, and sometimes become one big cookie on the pan? Excessive spreading can be caused by butter that was melted too much, not enough chilling (especially if the recipe you’re using calls for melted butter), expired baking soda or powder, or too much sugar (particularly if it calls for all granulated white sugar), or sometimes not enough flour. I would say start by chilling your cookie dough for 30 minutes before baking, and see if that helps! Why are my cookies crispy, and not chewy? Overbaking is a common issue if you’re getting crispy cookies, not chewy. So try reducing the bake time by a minutes or two and see what happens. Also, look for recipes that use all butter (not any shortening), and lots of brown sugar. Also, oven temperatures often aren’t quite accurate. I highly suggest buying an oven thermometer, and checking it to see what’s really going on. My oven tends to be off by 25 degrees at lower temperatures, and by 50-75 degrees at higher temperatures. That’s insane, and definitely led to problems before I bought an oven thermometer. Definitely depends on your personal preference. I honestly don’t think there’s really a wrong answer to this. I prefer to use a semi-sweet or dark chocolate for my chocolate chip cookies. Chocolate chips are economical, and easy to use. When feeling fancy, I’ll use blocks of chocolate that I cut into chunks. A tip from Kristie is to use high-quality bittersweet baking wafers to pop on top of each cookie when there’s 2 or 3 minutes left of bake time. 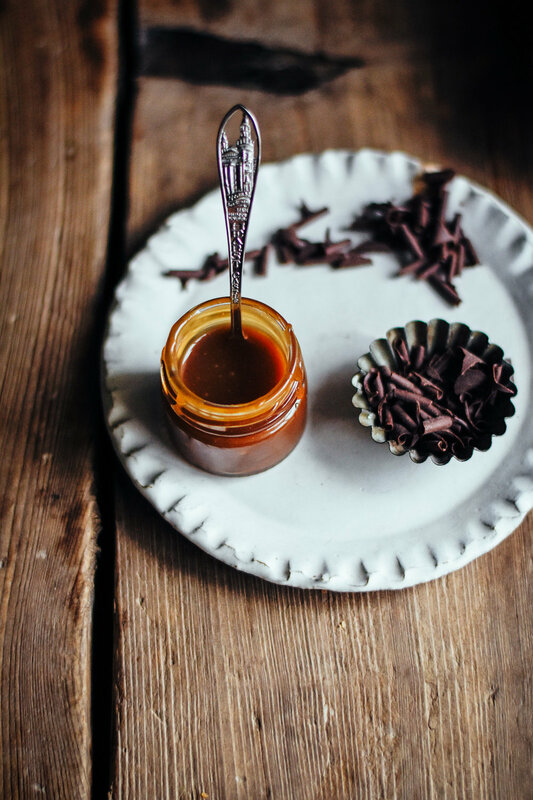 They’ll melt into wonderful pools of liquid chocolate, and add such a fun, finishing touch. What is the best surface to bake on, parchment, baking mats, dark pans vs light pans, etc? My personal favourite is to use a silicone mat (I use silpat - not sponsored…lololol - it’s what my family’s used forever!) They keep baked goods from getting too brown or burning on the bottom, nothing sticks to them, they’re amazingly easy to clean, and they’re re-usable! I sometimes use parchment, especially in photos (sigh…that food photographer life), but silpat is my go to for sure. Dark pans vs light pans. Dark pans tend to absorb and radiate heat more quickly = bake and brown things quicker versus lighter pans. Light pans may not give you the crispiness you desire in certain recipes! This will be a trial and error as you test the pans you have, and figure out what you’re looking for! You can accomodate these differences by simply adjusting the baking temperature a little if needed. Pans tend to darken with age as well, so keep that in mind too! How do I size my cookies easily and consistently? I love using a cookie scoop! Or an ice cream scoop (same thing really!) They come in lots of sizes, and make scooping perfectly round, similarly sized cookies so so easy. In the freezer! Seriously, immediately after I make a batch of cookies, I pop them into an airtight container and place them in the freezer. It keeps the flavour super fresh, and doesn’t let them dry out or get stale. Cookies will keep very well for weeks (or months) in the freezer, and you can pull them out whenever needed. Also, I love freezing cookie dough too! I scoop out the dough I don’t want to bake onto a cookie sheet, place the entire thing in the freezer for an hour or two, and then scoop them all into an airtight container or freezer until I’m ready to bake them. Freezing them on a cookie sheet individually keeps them from sticking together once you consolidate them all in one container. Ready to bake them? Take them out and place them on a cookie sheet, and let them rest at room temperature while your oven preheats. Bake for 1-2 more minutes than usual. So easy! 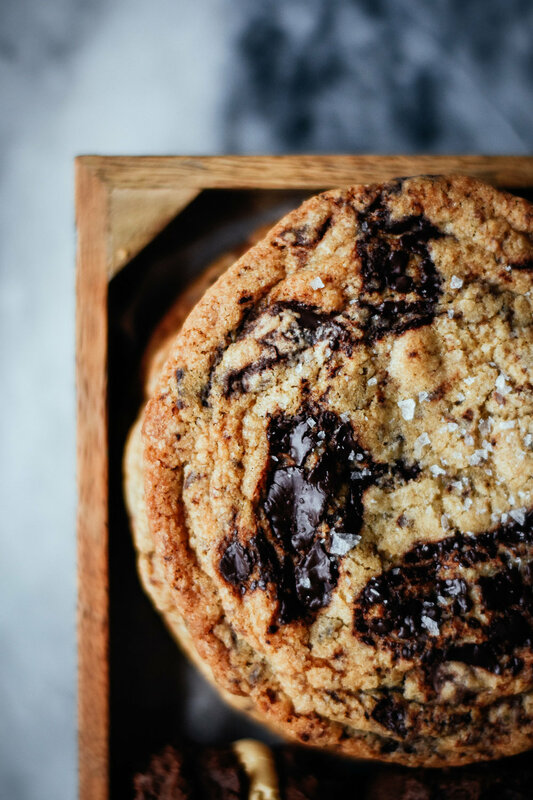 Pan Banging Chocolate Chip Cookies – These are by Sarah Kieffer and you can find it in The Vanilla Bean Baking Book, as well as on my blog here! 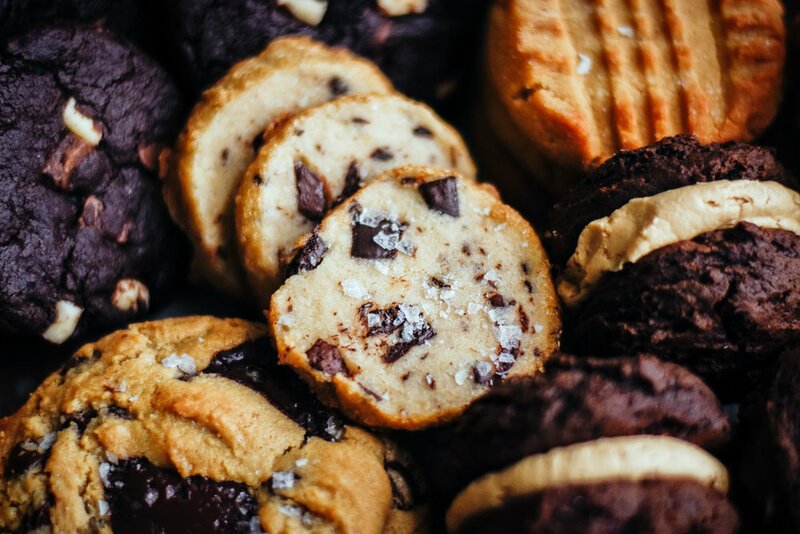 Salted Butter & Chocolate Chunk Shortbread – This recipe is by Alison Roman, and you can find it here! 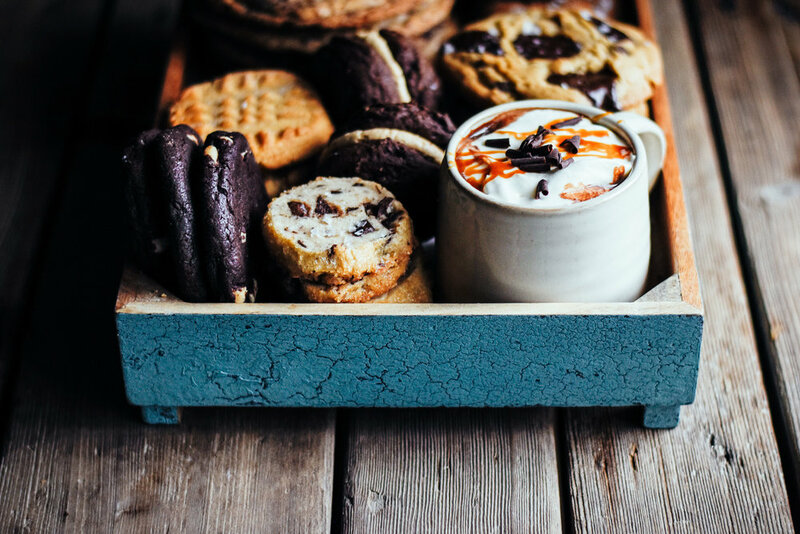 Triple Chocolate Chip Cookies – This recipe is courtesy of my sister…and soon to be shared on the blog! Brownie Crinkle Cookies – Recipe courtesy of Edd of The Boy Who Bakes; you can find on my blog as well! Chocolate Espresso Sandwich Cookies – aka The Defibrillator from @displacedhousewife’s new cookbook! Classic Chewy Chocolate Chip Cookies – find the recipe for them on Kristie’s post!